So I get promos from various record labels as part of my work with Sonic Cathedral, and one such label is Massacre Records. A while ago, I received a promo for this band I'd never ever heard of called Damnation Angels, who were based in the UK, but who have a familiar vocalist at the helm: PelleK, who hails from Norway. PelleK is well known for his covers of various metal songs, Nightwish included, and he often gets a bad wrap for being "cheesy" sounding, which I happen not to agree with. I kinda like his covers and think he's got some serious singing capability. So when I found out he was the lead vocalist for Damnation Angels, I made sure to give the album a good listen - or many. I do, after all, enjoy listening to the dudes of metal, I just don't have as many opportunities as Sonic Cathedral specializes in female-fronted bands. So this was a nice treat, and it was an especially nice treat as it really sort of knocked my socks off. 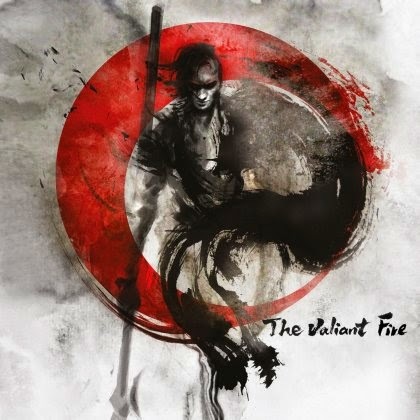 The Valiant Fire dropped in Europe March 23, and it comes to North America June 23. It contains 9 songs and over an hour of music, and the music is good. I can't say how impressed I was with this album, which is both epic and progressive, and somewhat reminiscent of Kamelot if you had to draw any kind of comparison with a more well-known band. The opener, "Finding Requiem" is a catchy, bombastic piece of full-on symphonic metal, and it's a great song to start of the album with as it sets up the tone and sound of the band is going for. And it just keeps getting better. "Icarus Syndrome", track two, continues on in a similar vein, and "This is Who We Are" is the shortest song on the album, at just over 5:30 minutes, but it's a pounding anthem of a song. The longest song on the CD, at nearly nine and a half minutes is "The Frontiersman", starts off slowly and you might expect a long-assed ballad, but before long it's galloping along at a great clip, and then towards the end, it slows down again for an emotional ending. It's one of the best songs on the album in terms of structure. Another favourite of mine on The Valiant Fire is "The Passing." The song is about a man on his death bed, taking a look back on his life, and it's a beautiful, powerful piece of music with a lovely melody and a fantastic guitar solo. PelleK pulls of slow, emotional, and sensitive as well as he pulls off the faster stuff. All in all, I don't think there's a weak song on this album. All of them are well-composed and very well-executed, with all the great trappings of the genre, but with a bit of progressiveness that elevates the music up a notch to another level. The speed and musical alacrity of this band kind of blew me away. The guitar work and the drumming are amazing, and combined with PelleK's vocals, Damnation Angels definitely have something special going on here. The Valiant Fire is their second album, following up 2012's Bringer of Light and an EP from 2009 called Shadow Symphony. I don't know why they are not better known, though they do have over 9000 likes on Facebook, so perhaps I've been too immersed in female-fronted stuff to notice them. Alas, the band announced on May 19, just a few days ago, that PelleK has left the band, and auditions are currently underway to find a suitable replacement. Interestingly, they are looking at men and women, so there could be the possibility of a female-fronted Damnation Angels in the future. I already have a draft list of favourite albums from female fronted bands for the first half of the year, but this album, along with the latest Kamelot release, are going to be up there for my general (i.e. male vocalists included) top 10 of 2015.